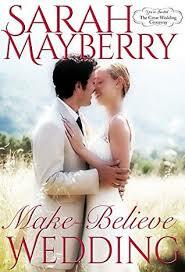 Sarah Mayberry brings to us book 9 in The Great Wedding Giveaway Series. I have read previous books in this series which were written by different authors and I really enjoyed it, therefore I decided to read the latest installment Make - Believe Wedding which did not disappoint. This was a short, sweet and well written novel which will keep you smiling throughout. What I had enjoyed most is that the female lead character Andie was not your typical romance female lead because she was an electrician who was tough and could hold her own in a male dominated world.This was a great read and I look forward to reading more books by Sarah Mayberry and the next book in the series. Andie Bennet has been in love with her brothers best friend Heath from the age of thirteen, but he has never seen her in that way. On the night of the Valentines Ball when Andie sees Heath dancing with another woman, she allows herself to fall into a fantasy world which leads to her filling in the entry for the Great Wedding Giveaway. Heath and Andie, by a twist of fate, end up being finalists in the Great Wedding Giveaway competition. In order to save Andie from public humiliation, Heath decides to pretend the engagement is real until the competition is over. During this fake engagement Heath begins to see Andie in a completely different light and realizes that this may be one of the best things that could have happend to him.